The year was 2004. For the first time in Pennsylvania, drilling on a Marcellus Shale well was completed in Washington County in the southwest region of the state, in an effort to access and extract the reservoir’s precious and—what producers hoped would be bountiful—supply of natural gas. The process itself was anything but simple. It required horizontal drilling hundreds and thousands of feet below ground, and the use of massive amounts of water for the purpose of hydraulic fracturing—better known as “fracking”—to force open existing fissures in the shale allowing for the extraction of the natural gas. While the drillers had hopes with the discovery well, they were moderate hopes. In truth, no one really knew what kind of production to expect. Before long, all that changed. The initial well produced solid results, to the point where additional wells were drilled in the area and other companies took notice. Eventually, the original producer permitted the drilling of more than 150 Marcellus wells in Washington County alone. Even entry-level gas and oil jobs were generating workers huge paydays. Land leases in the Appalachian basin, which had been going for $25 per acre with a 12.5 percent royalty, skyrocketed, in some cases reaching as high as $6,000 per acre and a 25 percent royalty. Pennsylvania began exporting Marcellus Shale gas overseas. Energy companies flocked to the state, opening new divisions. And the fortunes of many landowners in the region started to flourish. Needless to say, among the most precious benefits being delivered by the Marcellus fracking boom, was jobs. Good jobs, thousands of them in Pennsylvania alone. The boom continued over the next several years. Headlines everywhere touted Marcellus Shale as an economic savior. By 2011 and 2012, the oil and gas boom peaked. Then, it started to happen. Drilling Marcellus Shale became so efficient and so productive that, by 2013 and 2014, the energy market became flooded. Prices dropped, and flat lined. 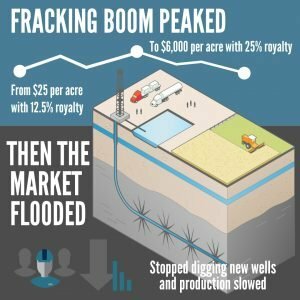 Producers stopped digging new wells, and production slowed. Eight years after the drilling of that first discovery well in Washington County, the bust ensued. It’s a cycle that, within the industry, happens. But it was the nature of just how big the Marcellus boom was that set this one apart, and the industry’s downturn continues today. In fact, according to Haynes and Boone, LLP, an international law firm that’s monitored the oil and gas sector for over 40 years, there have been 119 oil and gas producers across North America that have filed for bankruptcy since 2015 alone, including five producers that filed for bankruptcy in just the first two months of 2017. In January, 2016, it was reported that natural gas producer Southwestern Energy was laying off 40 percent of its workforce, including 200 jobs in Pennsylvania. 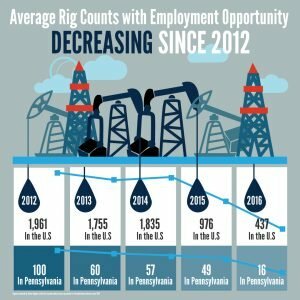 And while getting comprehensive data on job losses within the industry is tricky, what cannot be denied are the ups, and more recently the downs, in the number of drill rigs operating in North America, and specifically, Pennsylvania. Figures released by Baker Hughes, which has issued weekly rotary rig counts for the petroleum industry since 1944, paint a fairly grim picture if you sync up rig counts with employment opportunities in oil and gas over the past five years. While the numbers released for April of 2017 do show a bump—to 843 in the U.S. and 33 in Pennsylvania—it’s hard to overlook the fact that April’s average weekly rig count dropped 78 percent nationally and 84 percent in Pennsylvania in the previous five years. Taking a step back from the minute details of the weekly and monthly numbers and looking through a broader lens, it’s clear that one word may best sum up opportunities for employment in oil and gas, including Pennsylvania’s Marcellus Shale region—volatile. And when it comes to employment and job security, that’s a word most people don’t want to hear. Even with a rebound, is it worth the risk? Again, experts agree that what’s happened in the oil and gas sector, especially as it relates to the Marcellus Shale region, shouldn’t be considered that big of a surprise. When production booms, workers are needed, employment goes up, unemployment goes down, market demand is satisfied, prices level off and in many cases drop, energy companies take it on the chin, production goes down, and job opportunities dry up. So in all likelihood, it’s really not a question of “if” oil and gas rebounds and employment opportunities begin to open up again, it’s a question of “when?” And it’s also a question of how big, or how tempered, that rebound will be. For people who are considering a job change, who want more stability, or are trying to take a step up on the income ladder, there’s a major question they need to ask themselves—is Marcellus Shale worth it even if the jobs do come back? After energy prices dropped and companies cut way back on production or packed up altogether—resulting in layoffs and unemployment spikes in what had previously been Pennsylvania’s heaviest natural gas producing counties—reports started to surface questioning the employment numbers that had been released years earlier related to the Marcellus Shale boom. While state government reports at the time, supported by pronouncements from former Pennsylvania Governor Tom Corbett, suggested that the state’s energy and gas industry employed more than 200,000 workers, that figure was called into question by economists, and many others. Instead, that massive figure also included individuals working in around 30 ancillary, or related industries, such as trucking, road construction, surveying and mapping, and other areas that aren’t directly involved with the drilling and extraction of gas and oil. The real figure? It’s tough to nail down. In a 2013 interview conducted by StateImpact, a reporting project of NPR, with an economist from the Pennsylvania Department of Labor and Industry, employment in the core industries related to Marcellus Shale was tabbed at around 30,000. To be clear, that’s a lot of jobs. But it’s a far cry from 200,000. And that was when the industry was at its peak. StateImpact later reported that the state’s Department of Labor and Industry identified a 19 percent drop in Pennsylvania’s oil and gas jobs between the third quarter of 2014 and the third quarter of 2015 alone. So, not only were there far fewer core jobs in Marcellus Shale drilling and extraction than some entities would have the public believe, but many of those jobs were filled by workers coming in from outside of Pennsylvania. Again, stepping back and taking a “30,000 foot” view, it seems that employment for Pennsylvania workers in Marcellus Shale is anything but stable. Especially when you compare that industry with others that offer more stability and better pay, with some short-term education and training. Take, for example, welding. According to onetonline.org, a primary source of occupational information, the average hourly earnings for welders in Pennsylvania is $18.34, which is 50 percent more than entry-level employees in oil and gas. And onetonline.org projects the need for welders in the state to increase six percent between 2014 and 2024. There are accredited education and training programs designed to position graduates for careers in welding, such as the one at Penn Commercial Business and Technical School. Situated in the heart of Washington County, where the Marcellus Shale boom was born, Penn Commercial has been educating and training students there for 85 years, and its welding program can be completed in less than one year. Another alternative to oil and gas is that of an electrician. The median hourly wage for electricians in Pennsylvania, according to onetonline.org, is $25.81 with a projected employment growth of 14 percent between 2014 and 2024. Much like welding, educational and training programs for those looking to become electricians can be completed in under a year, and in some cases—such as the program at Penn Commercial—in as little as nine months. And yet another solid and secure skilled trade profession for those looking to steer clear of the shaky employment ground of Marcellus Shale is Heating, Venting, Air Conditioning, and Refrigeration (HVAC-R) technician. A quick look at HVAC-R shows that the average hourly earnings for technicians in this field working in Pennsylvania is $21.69, again courtesy of onetonline.org. And as with the previously stated trade skills, the outlook in terms of future growth for HVAC-R technicians is bright—with the need for trained technicians increasing 11 percent in Pennsylvania between 2014 and 2024. These are just a few examples of the kind of skilled trade professions that have stood the test of time, offer higher pay than entry level workers in oil and gas can expect—in some cases more than doubling the hourly wage—and are expected to continue growing through the middle part of the next decade. And consider the versatility that comes with each of these professions in terms of the wide range of settings that needs their services. New construction. Rehabs and renovations. Commercial. Residential. Industrial. Automotive. A welder can take his or her skills and put them to work in a broad spectrum of work settings. As can an electrician. And HVAC-R technicians are needed whether it’s a small residential job, large commercial project, or a massive industrial site. When it comes to job security, the potential for growth, and the ability to reliably provide for a family over the long term, these skilled trade professions would seem to offer a more logical path ahead than the shaky employment ground of Marcellus Shale.